Last week, author Patrick Ness won the Carnegie Medal, and illustrator Jim Kay won the Kate Greenaway Medal for A Monster Calls. This double honour speaks to the profound beauty and power of the book: a story of a boy whose mother is sick with cancer. It’s a dark, haunting, and sad story, but it’s also a hopeful story, a narrative that acknowledges the child’s capacity for every human emotion, good and bad. It points to the infinite depth and potential children possess, and credits them with the ability to face sadness and darkness. Indeed, this is a point Ness returns to again and again in his work. In a recent interview, Ness states “my books for teenagers have all ended up being about being heard. About being taken seriously. About being treated as a complex creation who doesn't always get things right but – importantly – also doesn't always get things wrong”. And, to adults who worry that A Monster Calls is too sad for children, Ness explains: “I've always disagreed - I think kids are far more aware and open to these things than we give them credit for". This statement will come as no surprise to readers of Ness’ Chaos Walking trilogy, a series that addresses issues of children and war, and presents its child-characters with questions of humanity, morality, and justice in a sweeping story of colonization and coming-of-age. Indeed, Ness’ final installment in the trilogy, Monsters of Men, from which the title of this post is derived, was awarded the Carnegie last year, making Ness among two authors to have been awarded the prize consecutively. In his most recent acceptance speech, Ness mounted an impassioned defence of libraries and teenager readers, trumpeting his belief that teenagers deserve and can handle these difficult narratives of the world, capable of understanding their immense complexity and nuance. To me, this message could not be more timely: a statement which is unfortunate, but true. We live in a world where we can’t deny the existence of terrible things: where news and media allow us glimpses of atrocity, reminding us that across the world people, and specifically children, suffer. Indeed, it seems an inescapable truth that in war and conflict, young people suffer the most. The BBC reports that in Syria, children as young as ten are being subject to torture, targeted in violent encounters, and used by soldiers as human shields. Meanwhile, it is estimated that there are 250,000 child soldiers in the world today, some abducted from their homes, others forced into military groups by extreme poverty. Child-soldiers are seen as ideal by the adults who target them: their impressionability and vulnerability allowing them to be easily manipulated, and their numbers making them easily expendable. We live in a scary world. But again and again, by leaders, by activists, and by artists, like Ness, we are reminded that there can be hope and change in it too. This month marks the 40th anniversary of the famous Pulitzer Prize winning photograph of nine-year-old Kim Phuc, a photograph snapped as she fled a bombing in Vietnam, her body burned by napalm. The picture became famous for its portrayal of the pain and suffering of conflict and war. Less known however, is the story of what followed. The photographer took the photo, then ran to the little girl. He gave her water and put water on her burns, and then later, he and a group of journalists fought for her transfer to a hospital where she could receive adequate treatment for her injuries. 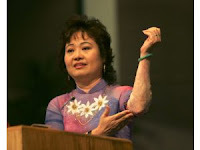 Kim Phuc grew up, came to Canada, and after years of attempting to escape the fame the picture had brought her, began to speak and tour publicly. She met with, and forgave, the pilots who it is believed dropped the napalm that burned her. She became a UNSECO Ambassador for Peace. And she established the Kim Foundation, an organization dedicated to funding groups that provide medial care and attention to child-victims of war and conflict. I know this blog post is a bit disjointed: it’s moved from mythical monsters and wars set on another planet, to very real stories of modern-day Syria and the Vietnam War. But as violence rages in the world, as more and more images emerge of children killed and harmed in conflict, I think that these seemingly disparate strands can and should be drawn together in the powerful picture they create. For me, there is no better way to honour the awarding of the Carnegie and Greenaway medal, and no better way to mark the 40th anniversary of the photo that brought the atrocities of Vietnam to the world’s attention, than this. These images, these books, remind us why we do what we do, and why we study what we study. We do it because we believe children deserve these artists: the ones who give them credit, who believe in their voices, who recognize their potential to be hurt and human, and who recognize their tremendous capacity to impact the world. We do it because we believe art has power. We do it because we believe that humans can be so much more than the monsters of men we see all too often. 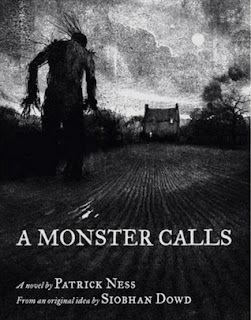 Patrick Ness’ work, the picture of Kim Phuc, her later life’s work: all these speak to the profound power of art, art to awaken the world, art to change the world, art to change the child. And, they point to the profound power of even the most injured child to grow up, to give back, and to challenge us to do the same.